Known for its Dependability In Design.As established technical innovator in the world chain drive market, serving a broad spectrum of industries with quality products for over 75 years. That is D.I.D. Our technology turns timely ideas into productive realities. D.I.D a professional partnership you can count on for your optimum drive system solutions. D.I.D’s PATENTED X-Ring construction reduces friction by twisting between the side plates instead of being squashed. Normal O-Rings and other makers’ modified O-Rings have squashed points that increase friction. The twisting action of the X-Ring disperses the pressure and minimizes power loss. The X-Ring’s four contact points greatly increase its sealing performance. This keeps the dirt out and the lubrication in much better than any other O-Ring. X-Rings have the greatest wear resistance of any other type of O-Ring or Non-O-Ring chain. D.I.D has merged our Professional O-Ring V Series and our top selling Premium X-Ring® VM Series into “ONE” New Pro-Street X-Ring® VX Series. Created from the severe demands of today’s top World Superbikes, D.I.D is proud to introduce this New high performance VX Series. In developing this new series, D.I.D focused on improving “Rigidity”. Traditionally, “Tensile Strength” has been used to indicate the overall strength of a chain. But Tensile Strength is only a laboratory static measurement of a chain’s “breaking point”. Rigidity, on the other hand, is the ability of a chain to withstand forces that occur in a rider’s real world experience. Increased rigidity means better power transfer from the engine to the ground and greater resistance to stretching under load. This translates into smooth handling and quicker response time. To maximize performance, D.I.D’s race proven X-Ring® design delivers overall improved performance that meets the demands of today’s high-performance machines. The VX Series is the ultimate in performance and durability, now available at a new low O-Ring Chain Price. VX Series Chains are available in 428VX, 520VX2, 525VX and 530VX sizes. D.I.D’s New PRO-Street X-Ring® VX Series Chains are a perfect match for your dual sport, sport bike or sport touring bike. D.I.D's engineers are continuously improving chain designs in order to handle the tremendous horse power loads of today's high performance motorcycles. D.I.D’s ZVM-X Super Street Series X-Ring® Chain was designed with better power transfer from the engine to the ground, greater resistance to stretching under load and overall improved performance that meets the demands of our current high-power, large displacement street bikes and the people who ride them. 5% Greater Tensile Strength. - 15% Greater Fatigue Strength. * The maximum c.c. displacement is based on original manufacturers recommended chain size. Consult your owners manual. The All New D.I.D 520DZ is the best value in a light weight, high performance chain designed for off road recreational riding. The 520DZ is rated up to a 450 c.c. dirt bike and is now available in our popular GOLD finish. *NOTE: Former ERT & 420NZ2 Connecting Links are not interchangable. 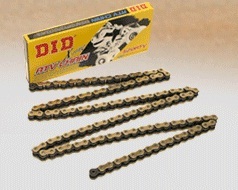 • D.I.D ER chain is designed exclusively for racing. • 520ERT2 is used by the top factory Supercross and Motocross Teams. • 520MX chain has higher tensile strength for maximum performance and is ideal for muddy conditions. • D.I.D's exclusive SDH pin treatment is the secret behind the superior performance of our 520ERT2, 520 MX and all NZ Series chains. This hi-tech pin treatment forms an extremely hard chromium carbide layer on the pins surface while maintaining a soft inner core. • SDH treated pins have extreme impact strength while maintaining outstanding shock absorption. This treatment creates a chain with anti-oxidation properties and superior wear resistance against invasion of hard foreign materials. 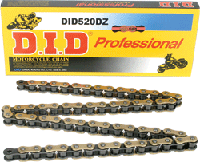 For offroad applications where a sealed chain is preferred, D.I.D's 520VT2 X-Ring® chain provides excellent low friction high performance. X-Ring® chain has 1.5 to 2 times greater wear resistance than standard O-Ring chain. 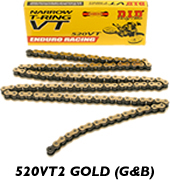 For offroad applications where a sealed chain is preferred, D.I.D's 520VT2 and 520VX2 X-Ring® chains provide excellent low friction performance. recommended chain size. Consult your owners manual. D.I.D's PRO-Street X-Ring® VX Series Chains are high quality X-Ring® chains with superior strength to withstand the horsepower of today's Dual Sports and Trials Bikes. The VX Series uses our patented low friction X-Ring® for maximum performance. technology as our VX, ZVM-X, ZLV, and ERV chains..
Special steel alloy is used to provide extra strength required for Quad racing.